It's so funny that not too long ago, I was saying how I wasn't ready for Fall and that I was holding onto Summer for as long as possible. Well, now I'm singing a different tune because I am so ready for Fall! Bring on the jeans and sweaters, I'm ready for it! It's gotten just a tad cooler here in Annapolis and I am loving it. The crisp air just makes me think of all the fun we'll be having like apple picking, or attending Fall festivals that happen locally, and just being by the fire with a cozy drink in hand. Plus, Fall to me means the holidays are coming up and that just gets me so excited and happy. 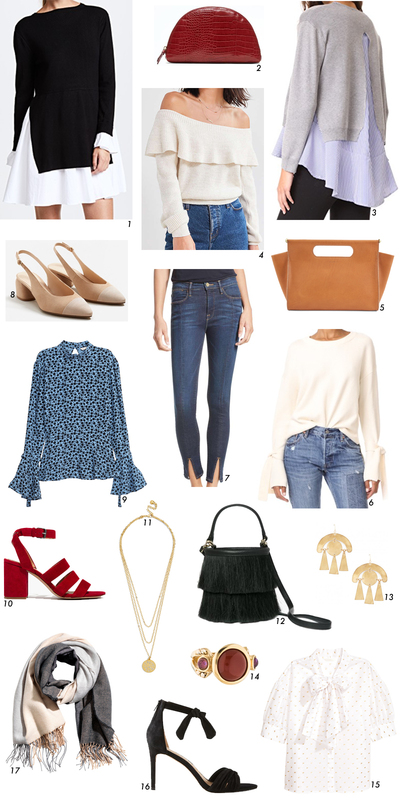 With Fall literally at our doorstep, I've rounded up some pieces that I am dying to get in my wardrobe. And I think each of these pieces goes well with each other, which makes getting dressed so much easier. I actually have #1 and #3 in my shopping cart now because I love the updated take on a simple sweater and sweater dress. If there were a pair of jeans you needed for Fall, it's #7 because the fit is amazing (so much stretch! ), and the split hem is remarkably flattering. See any favorites here? What are you guys most looking forward to in Fall? Or any specific article of clothing that you have to update for the new season?